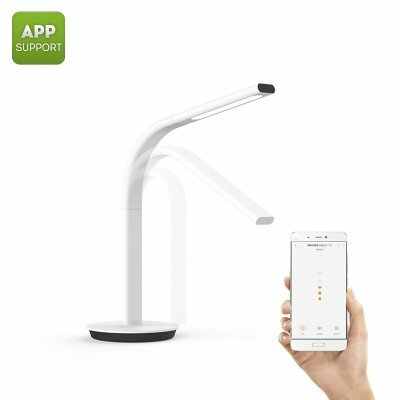 Successfully Added HK Warehouse Xiaomi Eyecare 2 Smart Lamp - Dual Light Source, App Control, Adjustable Brightness, Philips Light Technology to your Shopping Cart. With the release of the Eyecare 2 smart lamp, Xiaomi has yet again released another smart home product that is is a true asset to any modern household. With its stylish design, this modern light can be perfectly used as a desk light, night light, or as a regular table light in your living room. Crafted out of aluminum, this light has an elegant and smooth look, allowing you to add some extra style and atmosphere into your house or office. Featuring the latest Philips smart light technology, this Xiaomi smart home accessory emits a dimmed light that has proven itself to be healthy to the eye. Connect this Philips smart lamp to your Mi Smart Home application on your smartphone, and with a single click, you will be able to control your light signal and optimize the light output received through your smart lamp. No longer stare into bright lights and damage your eyes while working with artificial light in a dark room – with the revolutionary Eyecare 2 from Xiaomi you’ll have a stylish lamp that allows you to work efficiently after dark without hurting your eyes. Holding two light sources in one lamp, the Xiaomi smart lamp allows you to light up an extra large area. Perfect to be used at your desk or as a reading light, this fashionable lamp is there to provide light in the darkness whenever required. Featuring 50 LEDs and emitting up to 1200 lumen, you can be assured that there will always be enough light for you to continue your tasks effortlessly at any time of the day. With its modern design, you will be able to bend and adjust the angle of your light in any way imaginable, allowing you to aim the light beam in such a way that you’ll always be able to enjoy an optimal brightness. The smart lamp itself can be controlled either through the Xiaomi Smart Home application on your smartphone or directly by a touch of your finger on the Smart lamp’s touch panel. Allowing you to adjust its brightness, you can be assured that you’ll always be provided with the right amount of light – supporting you to continue your tasks, read a book, or simply light up your room after dark in an efficient, healthy, and stylish manner. With this smart lamp at hand, you will be able to enjoy a bright light comfortably without ever needing to worry again about hurting your precious eyes. The Eyecar2 smart lamp from Xiaomi comes with a 12 months warranty, brought to you by the leader in electronic devices as well as wholesale electronic gadgets..
Arabic: - مصباح الذكية - Chinese Simplified: - 智能灯 - Czech: - Chytré světlo - Dutch: - Slimme Lamp - French: - Lampe intelligente - German: - Intelligente Lampe - Hebrew: - המנורה חכם - Hindi: - स्मार्ट लैंप - Hungarian: - Intelligens lámpa - Italian: - Lampada intelligente - Japanese: - スマート ランプ - Korean: - 스마트 램프 - Malay: - Lampu pintar - Norwegian Bokmål: - Smart lampe - Romanian: - Lampă de Smart - Russian: - Смарт-лампа - Spanish: - Lámpara inteligente - Thai: - หลอดไฟอัจฉริยะ - Turkish: - Akıllı lamba - Vietnamese: - Đèn thông minh.